How do I recline and reverse the JIVE²/METRO² Main Toddler Seat? How do I adjust the JIVE²/METRO² Telescopic Handlebar? How do I use the 5 point Safety Harness? How do I check the balance of my Gift Certificate? How do I buy a Gift Certifcate? How do I put the Winter Cocoon on the seat? How do I use the Footrest? How do I use my JIVE²/METRO² as a Travel System? Whilst the trick to using our 5 point safety harness may not be immediately obvious, it's easy once you know how, you need to place the buckle into the harness and then snap it backwards to lock it into place. The 5 point Safety Harness is the same design for the JIVE², METRO² and SKIP. 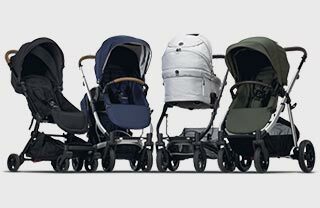 Why do Redsbaby prams have a 5-point harness system?